Minor League Baseball sets issued by teams today don’t carry much weight when it comes to the collecting world. They’re drastically overproduced, and the players most likely already have cards in more in-demand products such as Bowman, Bowman Chrome, Bowman Draft, Bowman’s Best, Pro Debut, and Heritage MiLB. I’m not saying there isn’t a market for them. Today’s collectors just have more options. During the 70’s, 80’s, and 90’s is where you’ll find some of the more popular team issued sets. Guys like Ryne Sandberg, Cal Ripken, Jr., and even John Elway pictured in an Oneonta Yankees uniform all received Minor League Baseball cards predating their nationally issued rookies. Depending on rarity and condition, these can be extremely valuable. Baseball Cards Etc issued a team set in 1988 for the Salt Lake City Trappers. Now they’re known as the Ogden Raptors. At the time, actor Bill Murray owned five percent of the team. It makes perfect sense that he received his own card. His brother Brian is also featured on another card in the same set as well. These two cards are literally the only reason why this set is continued to be talked about today. None of the other players went on to have historic careers. If you watched any of the World Series last year, you’d know what a huge baseball fan Bill Murray is. 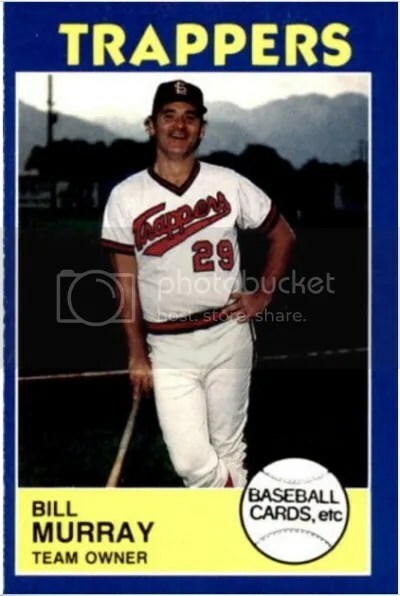 He was rocking that t-shirt that said “I AIN’T AFRAID OF NO GOAT.” The 1988 Salt Lake City Trappers team set is the first time Bill Murray was featured on cardboard. It wouldn’t be his last though. Over the years, other teams he’s been involved with have included him in their sets. Here is a rundown of all the Bill Murray baseball cards you could add to your collection. Mr. Murray does have a handful of other cards from various entertainment products. Leaf even made a cut signature of him in 2012 numbered to only (1). Most collectors treat the card of him pictured alone from 1988 as his “rookie” card. Three copies recently sold for $75 each. I know one of these years we’re going to see Bill Murray show up in Allen & Ginter or Goodwin Champions.